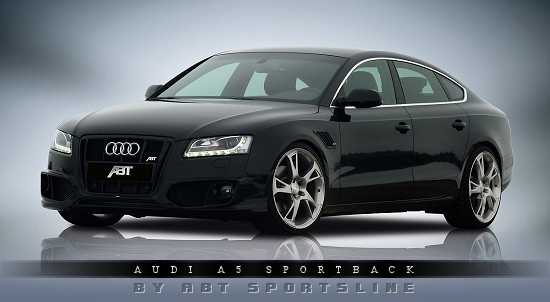 Abt Sportsline are now introducing their offerings for the new Audi A5 Sportback. The 3.0 TDI engine, which generates 240hp as standard, can be tuned up to 310hp. A chaeper option produces 282. For the 2.0 Litre TFSI model, the Bavarians offer an upgrade to 275 horses. This is more than a plus of 50%, because the production version develops 180 hp only! To make the tweaked A5 safer, stopping distances can be shortened by means of an Abt sports braking system. This feature is hidden behind larger wheels. Diameters of 18, 19 and 20 Inches are offered. Regarding lowering, there are two options on store: A set of springs and a complete sports suspension. 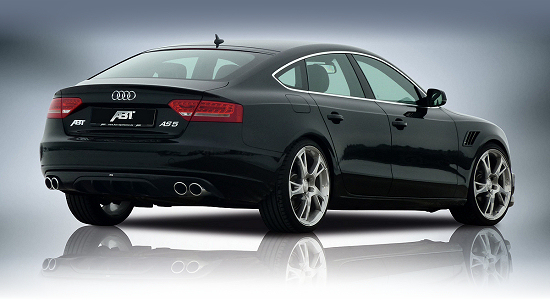 And in case even more sporty details are needed, a full aerodynamic package can be ordered at the German Audi tuners. There's also a grille insert, side gills for the front fenders and a 4-pipe rear muffler to top off the exterior conversion of Ingolstadt's stylish A4-based sports salon.